The South Pasadena Certified Farmer's Market is open on Thursdays 4:00 pm – 8:00 pm (rain or shine) except Thanksgiving. The market is located at the intersection of Meridian Avenue & El Centro Street in South Pasadena. The market is half a block from the Metro Gold line. The South Pasadena market is very family oriented. There are regular puppet show, plays and music. The market also has a variety of great food. Regular vendors include rotisserie chicken, crapes, and an oyster bar. Sebastian hosting our booth at the South Pasadena Farmer's Market. Sebastian hosts our booth at the South Pasadena Market. He enjoys seeing his regular customers and meeting new people who live in and around the South Pasadena area. Sebastian works for the Fillmore Fire Department and married with two boys. He lives in Fillmore during the week and in Santa Barbara on the weekends. 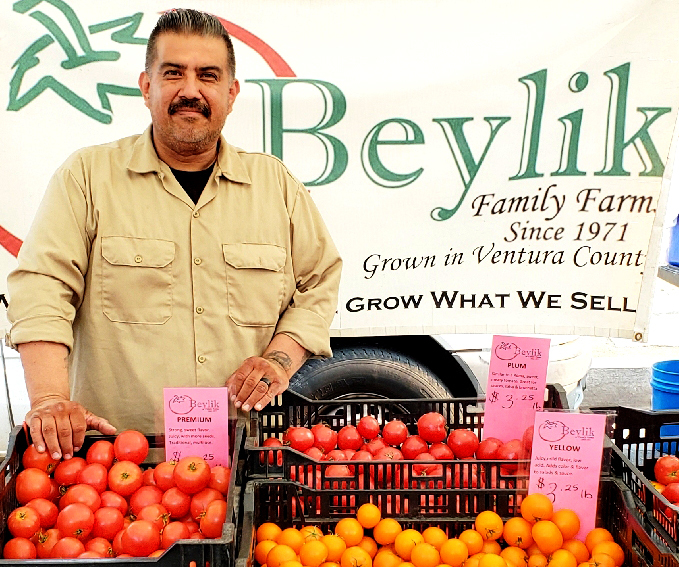 Please stop by and say hello to Sebastian at the South Pasadena Certified Farms Market. Newer PostTomatoes Are Back In Full Production!